Yesterday we visited ProWein in Düsseldorf. Up front I had made the wise decision to only explore the wines of Bordeaux. With that the whole thing was at least 'surveyable'. ProWein is drearily huge. Hall after hall stretches out, country after country, with countless sorts of wines. And everyone is trying to get attention. Anyway, ProWein is one big busy wine frenzy. 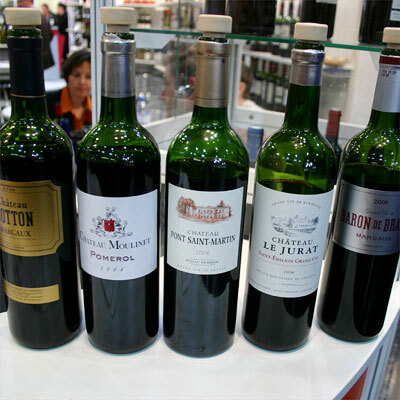 But enough about that, let's focus on something good: the wines from Bordeaux that I encountered. I tasted a large number of wines, and in this posting I shed light on a few, the 15 that I liked the most. The descriptions are brief, as I didn't have the time to make extensive notes. 1. Clos des Demoiselles 2005, Listrac-Médoc. Soft fruit, pleasant, freshness, classic, good texture. Harmonious wine, much more open now than last year. 2. La Chapelle d'Aliénor 2004, Bordeaux Supérieur. Dark fruit, vital, powerful. Freshness too. Straightforward, not complex but a good wine (Maison Malet Roquefort, from La Gaffelière). 3. Château la Gaffelière 2004, 1er Grand Cru Classé de Saint-Emilion. Complete, classic, medium-bodied. Still young. Balanced and quite refined, classy. 4. Château Arnauton 2005, Fronsac. Dark and intense. I particularly remember its force from the last time I tasted it, but now it comes across quite pleasant. Is it loosing its hard edges? Will soon retaste this wine. 5. Château de Gironville 2006, Haut-Médoc. Very good and vital fruit, good concentration. Convincing wine, very well made (sibling of Haut-Médoc Château Belle-Vue). 6. Château Fonroque 2006, Grand Cru Classé de Saint-Emilion. Yes! One of the best this day, this organic Saint-Emilion. Refined-seductive. Tender base. Not heavy. Good acidity. Refined is the word that keeps coming back. 7. Château Liversan 2006, Haut-Médoc. Fresh and pliable, quite mineral wine, light to medium bodied, expressive, showing character. Harmonious. 8. Château Pauillac 2006, Pauillac. Proud and vital, with good structure and healthy fruit. Straightforward, no-nonsense. 9. Château Notton 2006, Margaux. Soft and juicy, easy, slightly spiced, tasty, very nice (again). Hearty, pure, drink young. Made by Brane-Cantenac, call it their 3rd wine. 10. Baron de Brane 2006, Margaux. This is the 2nd wine of Brane-Cantenac. Same style as the Notton but more structure. Hearty too, and good balance. Finish to chew on. 11. Château le Jurat 2004, Saint-Emilion Grand Cru. Trouvaille, located next to Grand Corbin-Despagne. Dark, hints of farm smells. Some sweetness. Bit of oak. Proudly standing. Good. 12. Château Pont Saint-Martin 2006, Pessac-Léognan. Another trouvaille. Manure (hint), some oak, quite polished. Modern. Nice, still young. 13. Château Moulinet 2004, Pomerol. Complete, juicy, hearty, solid, hint of sweetness, some oak, seductive, fraîcheur too, fine finish. 14. Château Robin "Classique" 2004, Médoc. Second wine of Vieux Robin (Bois de Lunier). Broad, spicy yet soft. Ripe and pleasant. 15. Château Vieux Robin "Collection Bois de Lunier" 2001, Médoc. Sweetness and power, warmth and tenderness. Ripe, supple... simply delicious. Very good wine (and not cheap). 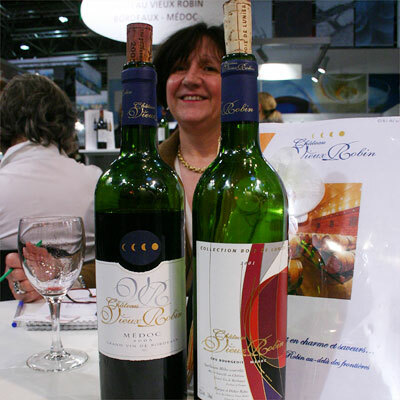 Maryse Roba, owner of Château Vieux Robin with two of her 2005's: the Cuvée "Bois de Lunier" and the Collection "Bois de Lunier". The nomenclature is intricate, but the wines are good. 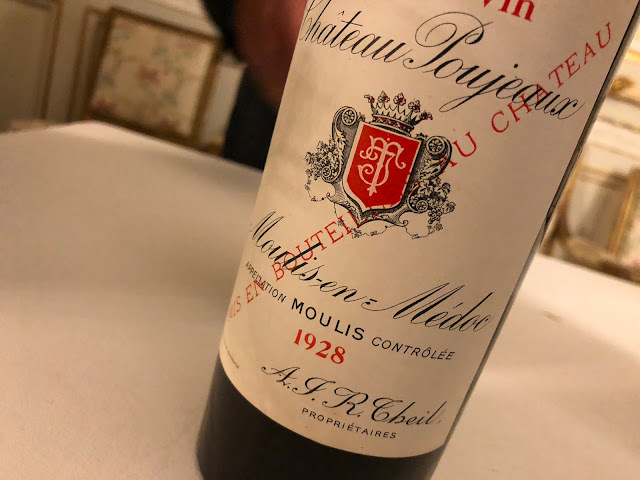 Finally − something I shouldn't forget mentioning − Bordeaux négociant Guillaime Cottin from Dubos was so kind to offer me a glass of Château d'Yquem 1997, and I briefly scribbled some keywords in my pocketbook: Suave-sweet. Mineral start. Unctuous. Endless finish. Freshness too, also in the nose. Superb. Altogether an interesting and well-spent day. We − Miranda Beems and I − finished in downtown Düsseldorf where I devoured a − very German − Eisbein: a huge pig's trotter served up to the skin. But no worries, it was well-shaved.